Purse; Boxy black leather handbag has an asymmetrically sculptural look with a textured, grooved front panel, borders, and short handle. 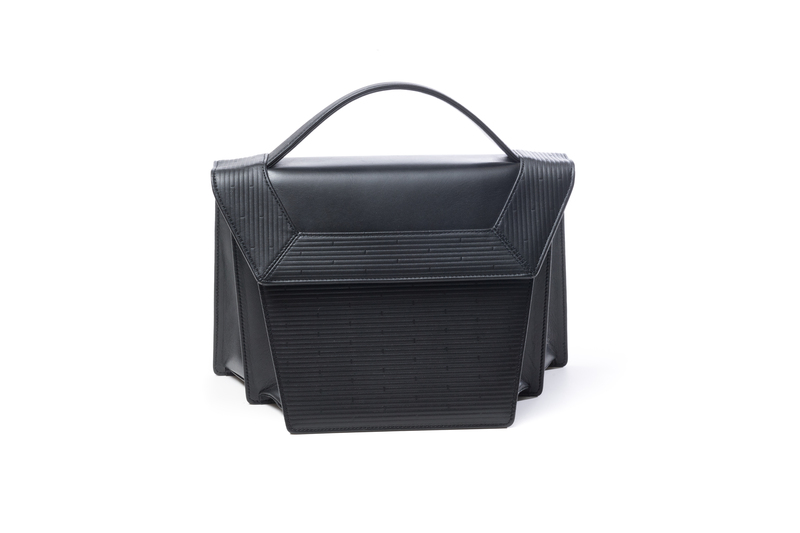 Purse's accordion-pleated main compartments stretch for extra room to reach inside. Compartments are separately lined with ivory faille. A single zippered pocket is worked into the lining at the back of the purse. There is a long exterior pocket along the back side of the bag. Purse is closed with a goldtone metal magnetic snap fastener. Designed by Gnyuki Torimaru of London.